. : Be Prepared: Los Campesinos! 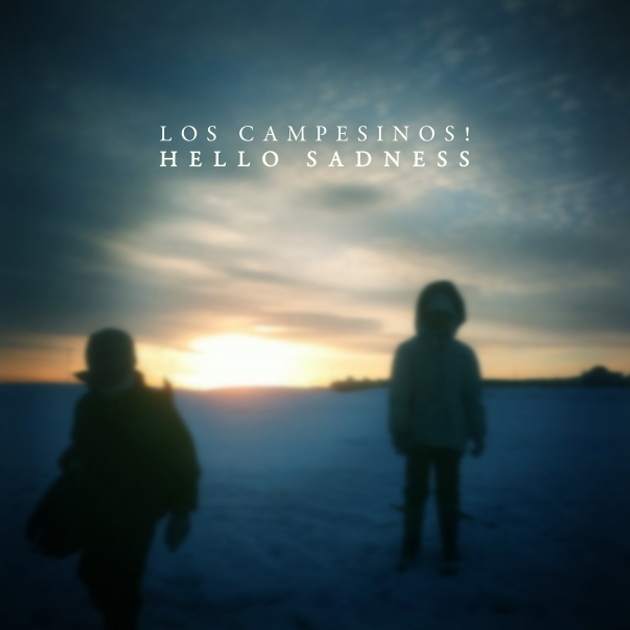 | Hello Sadness | 14 Nov.
Be Prepared: Los Campesinos! | Hello Sadness | 14 Nov.
Cardiff-based indie rock behemoths Los Campesinos! disclosed today that it will issue its fourth long-playing record Hello Sadness Nov. 14. As we've heard none of the new music, let's quote the septet's announcement: "Hello Sadness is ten songs of love, loss and heartbreak nail-gunned to a back-drop of broken, tangled bodies, creeping, dead-eyed animals, suffocating, looming shadows and World Cup exits. It is an honest, bare bones documentation of breaking up and trying not to break up in the process." The full track list is posted at the band's web dojo right here; fans will recognize the song titles as the same as those floated out on the social networks recently by fronter Gareth Campesinos! The collection is available in vinyl and CD pre-order bundles, with special pricing for members of Los Campesinos!' Heat Rash subscription service that was commissioned earlier this year. Bundles include a digital download of the record; an exclusive DVD of footage from the recording of Hello Sadness earlier this year in Girona, Spain; a t-shirt; and a bonus CD of demos for the band's first full-length Hold On Now, Youngster. The disc is simply titled The Demos, and the music thereon was apparently only recently "unearthed," and includes an apparently rare tune "How I Taught Myself To Scream" the never-before-released "No Tetris." Hello Sadness is out in North America on Arts & Crafts, and in the UK on Wichita. Frankly, the cost of shipping from Arts & Craft's Gallery AC digital storefront ($18?, rendering the $40 LP pre-order a staggering $58) is likely similar or even more than what a North American will pay ordering from the UK, so it probably doesn't matter from which continent you order. Los Camp's previous album Romance Is Boring was our favorite record of 2010.